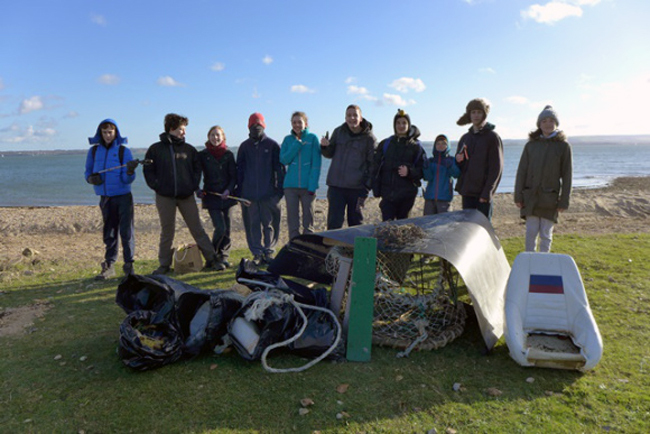 Together with the Hampshire and Isle of Wight Wildlife Trust, we are delighted to have set up a group of young people, aged 13 - 17, who share a love of nature, called the Young Naturalists. Under the excellent supervision of Tracy Standish, this group meets every last Sunday of the month at their Blashford Lakes Nature Reserve in Ringwood, on the edge of the New Forest. Sessions include practical conservation and habitat management, species surveys and monitoring, learning from local wildlife expert(s) and more. Our hope is that over the next 4 years, this group will grow and offer exciting new opportunities which amongst other things, will include a summer school, traineeships and accredited learning programmes. We were delighted to have recently received an award of Highly Recommended in the Young People category by the CPRE (The Campaign to Protect Rural England). This award recognises schemes which celebrate a beautiful, diverse and living countryside that everyone can value and enjoy. 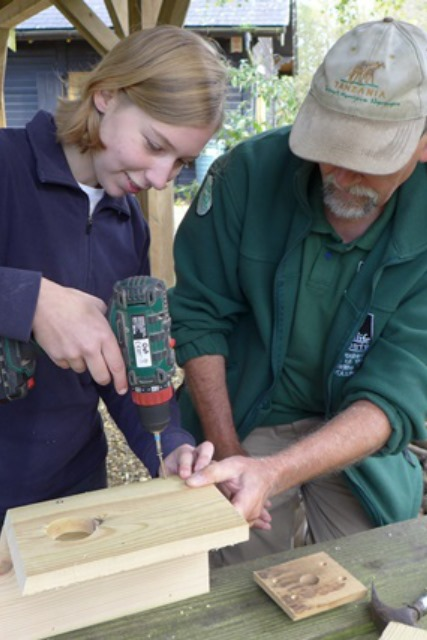 Want to Join the Young Naturalists? 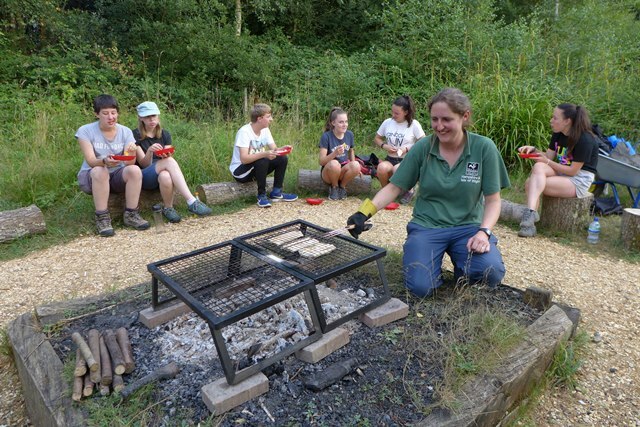 At the end of July the Young Naturalists spent a night out under the stars at Blashford Lakes so they could experience the delights of the Reserve late in the evening and early in the morning. After arriving on the Saturday morning they got straight down to the task of setting up camp, using old army ponchos to make dens to sleep under and whittling pegs out of willow. Once that was done, the Young Naturalists took part in a butterfly count and explored the local Rockford and Ibsley Commons. Next on the list was setting insect light traps and mammal traps in the hope of catching some interesting wildlife overnight. After dinner round the campfire the group set out on a night walk to hunt for bats. The managed to pick up Pipistrelle bats on the bat detectors in the woodland and near Ivy South hide. It was then to bed for some well-earned sleep and to prepare for an early 5.30 am wildlife-spotting walk. Whilst they didn’t spot anything out of the ordinary on the walk they had a good wander and worked up an appetite for breakfast cooked over the campfire. A check of the overnight mammal traps yielded nothing despite a couple of them having been sprung. The light traps however provided 31 different species off moth to identify, along with a Dark bush cricket and an Oak bush cricket. In all, it was a fabulous night out on the reserve. 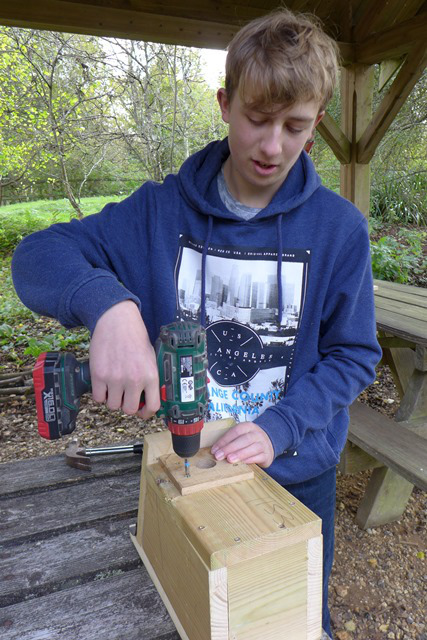 At the end of June the Young Naturalists travelled to Martin Down National Nature Reserve in Hampshire. The reserve is home to a fantastic variety of plants and animals associated with chalk downland and scrub habitats. The group were interested to see what flora and fauna they could spot and the list of species got off to a good start, spotting Bullfinch and Yellowhammer and then hearing Chiffchaff calling. They were also lucky enough to hear the purring of Turtle doves at a couple of different spots. The insects did not disappoint either and the group were treated to sightings of Cinnabar moth along with Meadow brown, Marbled white, Small skipper, Brimstone, Gatekeeper, Small heath, Holly blue, Ringlet, Small white and Small tortoiseshell butterflies. 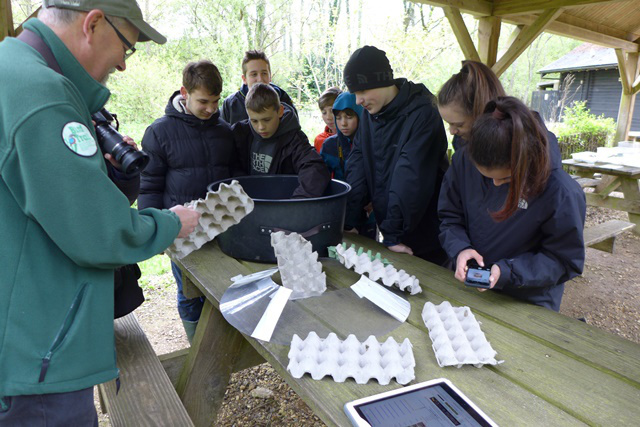 At the end of April the Young Naturalists were joined by Paul from Strong Island Media, who had come along to take photos and film them during a session. As a result they managed to fit in a wide range of activities to showcase what they get up to and in the process enjoyed a very varied day! Watch the video to learn more about this group who meet every last Sunday of the month. 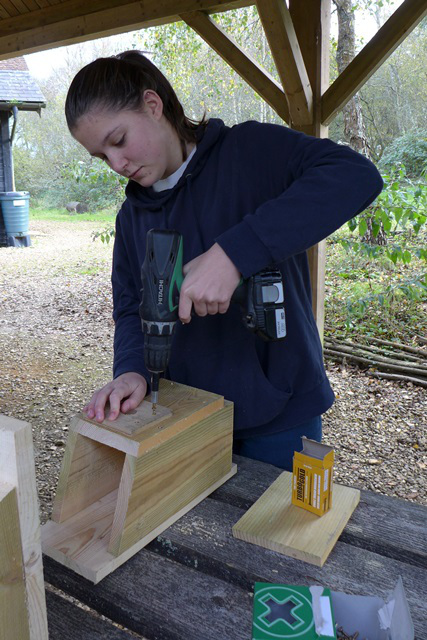 Eleven of Young Naturalists made twelve very fine bird boxes to replace some of the older ones on the reserve that have seen better days. Volunteer Geoff very kindly sourced some offcuts of timber and pre-made the kits for the session, leaving the group with the task of putting them together and numbering them, so they could be identified later on and monitored. 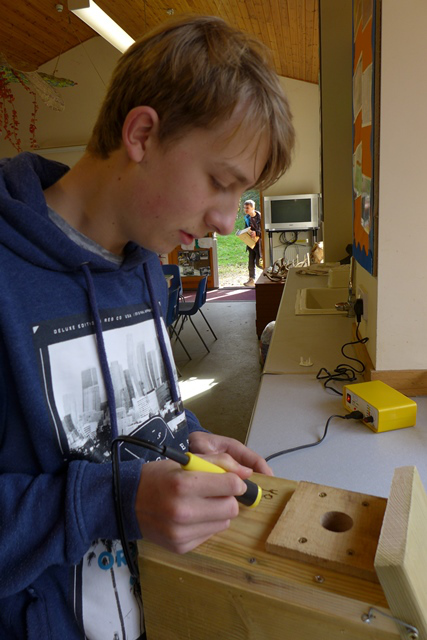 I’m not sure what they enjoyed the most, the opportunity to use power tools or the opportunity to have a go at pyrography to put their stamp on their creation. 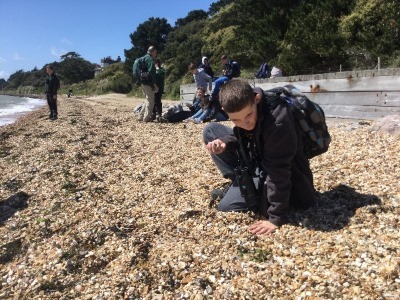 The Young Naturalists participated in the Hampshire and Isle of Wight Wildlife Trust and Hampshire Ornithological Society “Bird Trail” at Blashford Lakes. 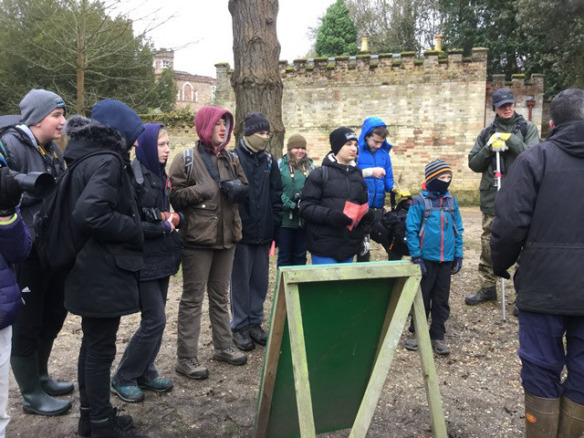 Before starting the trail, the group watched a bird ringing demonstration and visited Liberty’s Owl, Raptor and Reptile Centre‘s static display of birds. Once on the trail they managed to spot 47 different bird species. On heading back to the Centre and handing in their sightings sheet, the Young Naturalists were delighted to discover their bird spotting efforts had paid off and they had come second in the competition. 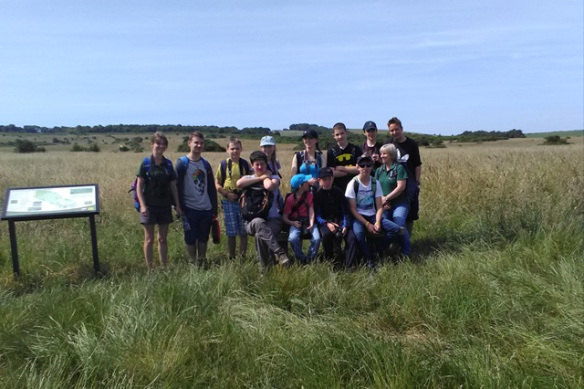 On 4th June 2017, twelve Young Naturalists joined us for a trip to Martin Down National Nature Reserve, one of the largest areas of uninterrupted chalk downland in Britain. Jointly owned and managed by Natural England and Hampshire Country Council, the reserve is home to a fantastic variety of plants and animals associated with chalk downland and scrub habitats. 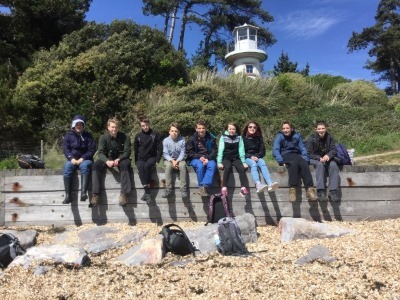 Click on the links below to find out more about the exciting activities the Young Naturalist group got up to during their residential weekend in Beaulieu.